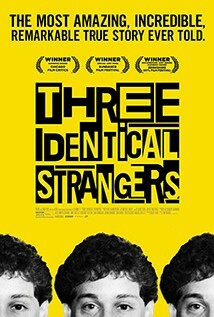 Three strangers are reunited by astonishing coincidence after being born identical triplets, separated at birth, and adopted by three different families. Three boys. Three different cities. Three very different upbringings. When they are 19 years old, one of the three boys (Robert Shafran) heads off to an obscure school in upstate New York, where he’s told he bears an eerie resemblance to a former student named Eddy Galland. The two young men meet. They are identical twins, mysteriously separated at birth, but overjoyed to be reunited. Their story makes all the New York dailies, where another teen, David Kellman, happens to see his face reflected not once, but twice, on the front pages. Their jaw-dropping, feel-good story instantly becomes a global sensation complete with fame and celebrity, however, the fairy-tale reunion sets in motion a series of events that unearth an unimaginable secret.